Impact Story – Gerald | Service Coordination, Inc.
Gerald has always been a hard worker. He has had several jobs over the years, and continues to work on a janitorial crew with some of his peers and staff from Community Living, Inc. Gerald also works in Community Living’s laundry department, where he helps to provide laundry services for businesses in Maryland. He held a job at Kids First Swim School up until 2017, but this ended because of safety concerns due to low vision. Gerald learned to use Transit, the Frederick County bus system at age 68, to get to work. Gerald and his team discussed semi-retirement, but Gerald decided he still wanted to work. In addition to working, Gerald has volunteered his time at local agencies such as Habitat for Humanity, The Salvation Army and the Frederick County Animal Shelter. effects of medications, learning to identify emergency situations and how to dial 911 if needed, how to unlock his front door to gain the independence needed to have independent time with his girlfriend. Gerald advocated for being able to spend time alone at his girlfriend’s home, and to spend the night twice a week. He also advocated for her to spend time at his house once a week. As the two got closer, they decided that they wanted to be together forever. Gerald worked on a goal to have a commitment ceremony and honeymoon. 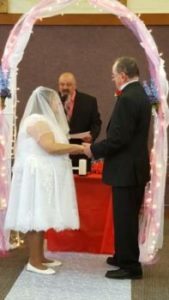 With help from his team, Gerald and his partner planned a commitment ceremony, invited guests to the ceremony, ordered food for the reception after the ceremony, hired a DJ and secured a pastor to officiate the ceremony. He also planned and took a Honeymoon to Tennessee, a place he and his partner have wanted to visit. Staff assisted minimally on this trip, but all decisions were made by Gerald and Linda. At age 69, Gerald had achieved his dream of commitment to his best friend. The united couple decided that they wanted to live together, but need support to do so. As they both resided with supports from the same agency, each of their Service Coordinators supported them in submitting Modified Service Funding Plan Requests to move into a suitable Alternative Living Unit. They worked with Community Living to find a suitable home within their agency and will be living together as of May.